After students have completed the Dragon Genetics experiment, they will individually practice Punnet Squares using the Bikini Bottom Genetics worksheet. Patrick met Patti at the dance. Both of them are heterozygous for their pink body color, which is dominant over a yellow body color. Create a Punnet Square to show the possibilities that would result if Patrick and Patti had children. List the possible genotypes and phenotypes for their children. After creating a Punnet Square, you would see that the possible genotypes and phenotypes for their children would be PP-pink body, Pp-pink body, and pp-yellow body. I would give students .5 of a point for listing the genotypes correctly, and .5 of a point for listing the phenotypes correctly. In the Genetic Disorder Research Project, students cooperatively explore a genetic disorder that interests them, research new information that is current in the scientific world, and present their findings to the class through a multimedia presentation. The students will be graded by me, as well as by their peers. 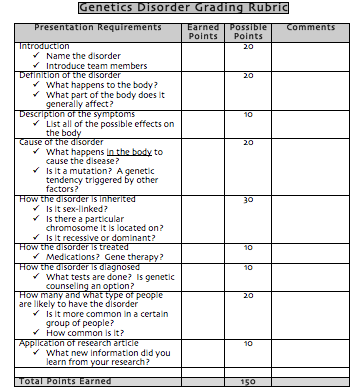 The rubric for this project can be found here. For my Post-Assessment of the Unit, I decided to have a Choice Board. I would give a more formal assessment, such as a multiple choice test, after teaching the rest of genetics the following week (co-dominance, blood typing, genetic technology, etc). This is a more informal, less stressful way to assess what students have learned from the unit, along with giving them choice in completing activities. The Choice Board can be found here. For each activity the student completes, they will receive 25 points for a total grade of 75 points. Points may be taken off for the activities being incomplete, incorrect, or for excessive grammatical/spelling errors.